People are at the heart of everything we do. Just as people are unique, organisations are too, and we all share a common bond: the need to make the most of our time. At Gartan, we’re not content for customers to simply use our software, our goal is for them to want use it. That’s why we’ve developed a way of working, a set of principles, called Crystal Clear® which puts people and clarity at the heart of our design philosophy. It’s a rigorous process, which keeps us focused on ensuring our software truly enhances the customer experience. Crystal Clear® inspires us to come up with clever ideas. So before we design, we ask ourselves how do people actually work? Why will someone want to use our software? Why would they not want to use it? How can we make the customer experience even better? Gartan solutions facilitate clarity across organisations by empowering people to make the best strategic decisions. Simply put; Gartan is software made for people. 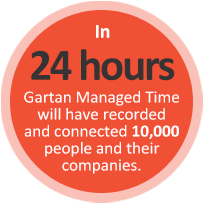 Gartan Availability enables managers and staff to schedule their availability. Managers can oversee part-time workers and ensure adequate staffing levels at any location. Staff can organise their personal availability from anywhere via the internet, text message or smartphone. Roster pulls together complex schedules right across the organisation. Our reports give you accessible and accurate information in an instant. There’s no digging or trawling for information. It’s right there, allowing you to make fast strategic decisions about staffing, compliance and competencies. Unlike any other major supplier, Gartan products are available not as a once-off package sale but through a license agreement. This licensing option will free your organisation from a high cost, long-term agreement.